In my last post on George Hatton, I included a newspaper account of his participation in a Decoration Day ceremony at Arlington National Cemetery. The story noted that Hatton made “a short but eloquent address” that has, apparently, been lost. Sharp-eyed readers may have also noticed that, buried in the text of the article, was a passing reference to the presence there of one Frederick Douglass. You may have heard of him. 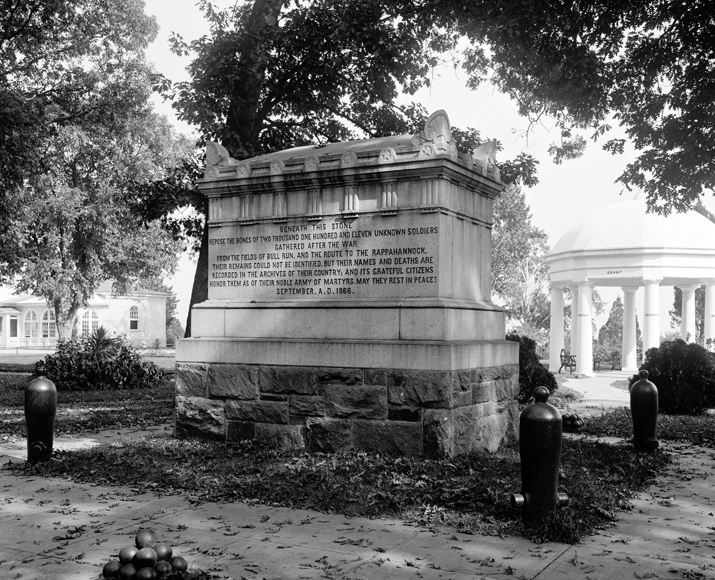 Oddly, the newspaper makes no reference to the speech Douglass gave that day, at the memorial to the Unknown Union Dead (above), which must surely rank as one of the most compelling of its type ever offered there. It’s a short address, worth reproducing in full. The remarkable thing about this text is how well it resonates, how well it presages the ongoing arguments about how we remember the war even today, almost a century and a half after the guns fell silent. Douglass’ admonition — “we are not here to applaud manly courage, save as it has been displayed in a noble cause. We must never forget that victory to the rebellion meant death to the republic” — must necessarily ring as true today as it did then. This is what Confederate apologists do not, can not, accept: that regardless of their ancestors’ courage and sacrifice, and regardless of their individual beliefs and motivations, at the end of the day they fought for a nation founded on a terrible premise. To honor our ancestors demands that first we see them as they were, not as we’d wish they’d been. Text of Douglass speech from Philip S. Foner and Yuval Taylor, Frederick Douglass: Selected Speeches and Writings. Image: Monument to the Unknown Dead f the Civil War, Arlington National Cemetery. Library of Congress. Hindsight being 20/20, Douglass’s words are not only very moving but ring very true. No doubt a CSA victory would have ended the influence of the United States at the time, and who knows what kind of lingering effects would have persisted; there is no guarantee that that USA would have been the same kind of nation, only smaller, that it would have retained its Founding documents/ideals amidst such a shock. But you open yourself up to the usual arguments regarding how an ancestor “was” at the time. If by “terrible premise” you mean the destruction of the Republic, remember that many Confederates sincerely believed that they were in fact saving the republic. If you mean slavery, then remember that many Unionists fought for Union and not abolition. In 1861, nobody had a crystal ball; just because Douglass was correct about the end of the Republic and the continuance of slavery had the rebels won doesn’t mean they all saw things that way at the start. If a “Confederate apologist” is simply honoring his/her ancestors with this understanding of perspective, I don’t see what the problem is; but if “Confederate apologist” means someone who actually wishes the CSA had won the war, well, that’s a totally different issue, and, in my opinion, the better one to counter through Douglass’s eloquence. Thanks for taking time to post a thoughtful comment. Yes, the “terrible purpose” I referred to was the preservation of the institution of slavery and its potential expansion into other territories. The individual men who went to war did so for a variety of reasons, most of which have gone unrecorded. It’s really important to distinguish here between national objectives and individual ones. You also wrote, “remember that many Unionists fought for Union and not abolition.” Dead right, and a good many Union soldiers wanted nothing to do with abolition, and chafed bitterly when the Emancipation Proclamation established abolition as an explicit war aim. Trip: I ain’t fightin’ this war for you, sir. Colonel Robert G. Shaw: I see. Trip: I mean, what’s the point? Ain’t nobody gonna win. It’s just gonna go on and on. Shaw: Can’t go on forever. Trip: Yeah, but ain’t nobody gonna win, sir. Trip: Who? I mean, you get to go on back to Boston, big house and all that. What about us? What do we get? Shaw: Well, you won’t get anything if we lose. Shaw: So what do you want to do? Shaw: It stinks, I suppose. Trip: Yeah, It stinks bad. And we all covered up in it, too. Ain’t nobody clean. Be nice to get clean, though. Shaw: How do we do that? Trip: We ante up and kick in, sir. But I still don’t want to carry your flag. This is a great post, Andy–as well as riposte in the comments’ section. In the movie Glory, the character Trip was right when he said “Ain’t nobody clean”. It is impossible to understand the Civil War and its aftermath without including the actions of both Confederates and the Union in relation to the “Indian problem”. I think that Frederick Douglass would have understood that, had he been confronted with the issue. Douglass may, in fact, have spoken about the “Indian problem” and I am not aware of it. At any rate, good work that you are doing! Andy, you do such an excellent job of revealing – and indeed revelling in – the complexities. God may not exist in the details, but History – good, solid, explain- the -past- to- the- present – History? Damn son, you got it nailed! This post of yours reminds me of the time I took my two grandchildren, Corey and Paige, to Gettysburg when they were very, VERY young. I took them all around the battlefield, especially to Little Round Top and the Devil’s Den, taking great care to explain the fighting that took place at each spot, proud that I knew the events of the day in such detail and that I could pass this on to both of them. As far as I know, the survival of the union is not in the US Constitution. The right of states to govern themselves is a key compromise. While the outcome of the Civil War mey be viewed as better than the alternative, it set the stage for the massive, all powerful, overreaching Federal Government we have today. Just as many of the Union soldiers were not fighting for abolition of slavery, many of the Confederate soldiers were not fighting for it. Rather, they were fighting for their states rights and the right of self determination. I cannot disagree. Ron, thanks for commenting (and subscribing). The permanence of the Union is not explicitly in the Constitution (though the previous Articles of Confederation referred specifically to the United States as a “Perpetual Union”), but that document is also silent on how, or even whether, states can leave the Union once they’ve joined it. There’s nothing there, one way or another. The right of secession was then, and remains now, a matter of contentious interpretation. Regarding the motives of individual soldiers, North and South, there are many reasons why soldiers volunteer to go to war, sometimes reasons they themselves cannot fully articulate. But we should not confuse those with the motives and objectives that their governments have in embarking on conflict, which are often very different that those of rank-and-file soldiers. How is that? Was the Union so despicable that no one wanted to be in it without the South? The South had no designs on the North, nor on changing the united State’s form of government. Douglass was very dubious of Lincoln and the Republican party, especially early on, as I’ve described elsewhere. However, like them, he saw the Republic as an indivisible whole. It’s a fundamentally different view of the nature of the United States as a nation than that held by the South as a principle that validated secession.